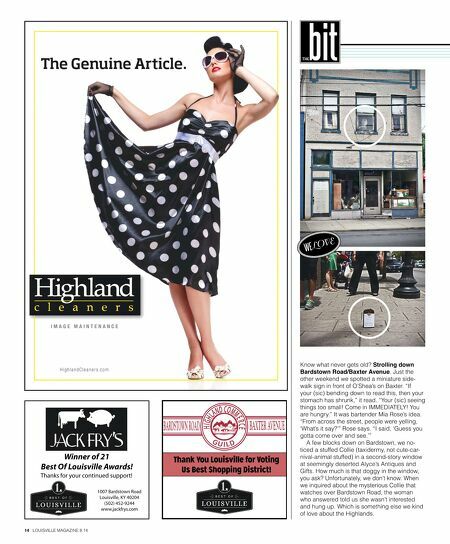 14 LOUISVILLE MAGAZINE 8.14 thebit WE LOVE www.highlandcleaners.com Winner of 20 Winner of 21 Best Of Louisville Awards! 1007 Bardstown Road Louisville, KY 40204 (502) 452-9244 www.jackfrys.com Thanks for your continued support! 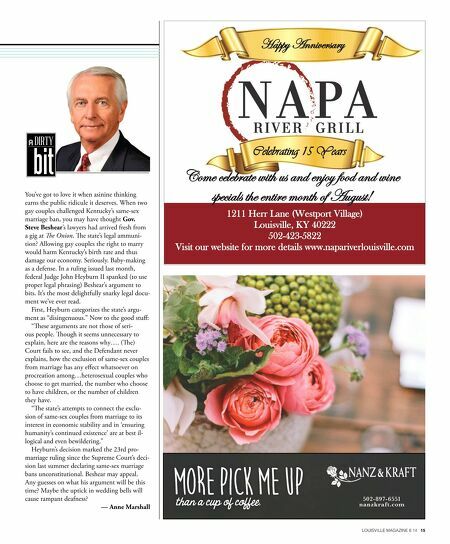 Thank You Louisville for Voting Us Best Shopping District! Know what never gets old? Strolling down Bardstown Road/Baxter Avenue. Just the other weekend we spotted a miniature side- walk sign in front of O'Shea's on Baxter. "If your (sic) bending down to read this, then your stomach has shrunk," it read. "Your (sic) seeing things too small! Come in IMMEDIATELY! You are hungry." It was bartender Mia Rose's idea. "From across the street, people were yelling, 'What's it say?'" Rose says. "I said, 'Guess you gotta come over and see.'" A few blocks down on Bardstown, we no- ticed a stuffed Collie (taxidermy, not cute-car- nival-animal stuffed) in a second-story window at seemingly deserted Alyce's Antiques and Gifts. How much is that doggy in the window, you ask? Unfortunately, we don't know. When we inquired about the mysterious Collie that watches over Bardstown Road, the woman who answered told us she wasn't interested and hung up. Which is something else we kind of love about the Highlands.